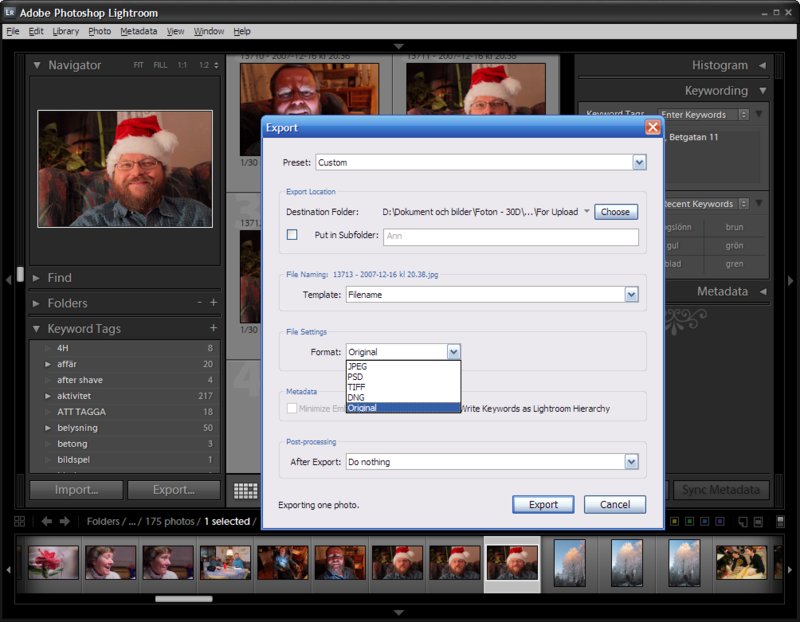 Since I only use Lightroom for keywording my JPEG photos, I want to be able to save my keywords to the JPEGs without changing the actual image at all. The fact that Lightroom by default modifies the look of JPEGs even though I haven’t touched a single slider is pretty annoying, but now I have found the solution. When exporting the photos (Ctrl+Shift+E) you can choose to export the original image data untouched by lightroom’s mischievous fingers. To do this, select the “Original” option under File settings -> Format, in the Export dialogue. Then, when I hit Export, the images will be saved in a new location. They will be exact copyies of the original, but they will be keyworded just as I want them, with synonyms, etc. Posted at 14:51. Categories: photography. Both comments and trackbacks are closed. I don’t know how Elements works (don’t have it) but you should try to write keywords to a couple of JPEGs and see if they how much they change in file size. (Take a note before you do anything!) If the actual image is untouched the file size shouldn’t differ more than a couple of kB at the most, I think. Cool, thanks, I’ll give it a go and see what happens. If the files dont work out how I want then I’ll just restore a backup and try again.